Christmas morning will bring us a lot of light. It is always with us, this light. 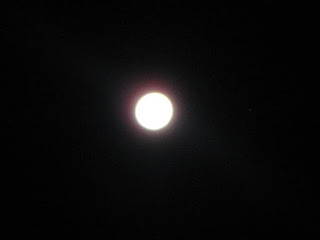 Yet this Christmas we have a full moon in the wee hours~ helping us to understand what truly feeds us. WHO feeds us. How we feed others, and what we really feel about our life as it right now. The best thing going with this full moon is that comfort food will bring comfort. The body needs it and the soul needs it. Family ties that are loving and strong will become even stronger. Full moon are meant to 'draw the emotions out'... ties that aren't there or are not healthy and loving will become very clear. We can let go. Seeing that not all relationships need to last a life time. The full moon brings things to an extreme. We see that in the fourteen tornadoes that just came through Tennessee and Mississippi. Nothing humbles one faster and deeper than Mother Nature. If you have a roof over your head you are blessed. If you have food in your belly you are blessed. If you have loved ones to hug you are blessed. And most of all, if you realize these blessings you are triple blessed, because you are AWAKE to the true meaning of Christmas and life. Venus is in Scorpio. That's a placement that will welcome the Full Moon in cancer... the Moon, Venus, Chiron and Neptune are creating a grand trine in water. SEE ME - FEEL ME- HEAL ME- RAISE ME UP. Who can do that? Well, the light. The divine consciousnesses, that circulates through all of us. Yes, some of us have faulty wiring and so 'short outs' happen, electric fires happen...but water can put all of that out. A grand trine in water says: I know there is love there in you - its deep down coz Venus is in Scorpio... but hey, I bet this warm macaroni and cheese filled with love casserole I made for you will open that door to love. HAVE SOME, NO, MORE.. do not be shy. Food does heal. So forget the diet right now, if you are lucky enough to have food on your table- heck to have a table! Let's keep it real: FOURTEEN TORNADOS JUST WENT THOUGH THE SOUTH.... There are lots of people who don't have tables anymore. Venus makes happy with Jupiter this Christmas. Jupiter is in Virgo- the practical gift will give great joy. The gift of your heart- I mean really giving- giving when you aren't getting....(not doormat) just giving love out- because the moon shined so bright it overflowed into your own heart space- the Christ Consciousness space. Its not about the wrapping. Its never about the outer. Its about the inner these days........ We have serious energy with the Sun moved into Capricorn. The solstice chart (the moment the sun entered into Capricorn) is really lovely. We've heard a lot about how Saturn is squaring Neptune (serious changes in the church, law, international fears, and helping the refugees).......but also along with Saturn in a square to Neptune- the movement is going to go in to a meet up with Uranus... a trine! Can I get a Hallelujah? LOUDER! AMEN HALLELUJAH! PRAISE THE POSSIBLITIES OF GOODWILL !!!! So this Solstice chart shows me that we will go into a three month period of focusing on HELPING EACH OTHER HAVE ENOUGH. Thought - WORD- DEED- they can actually match. Oh, sure the drones of spin will still be around...but that's just bad grammar. They will fail the test. We have these masses here- IN AMERICA- and also wanting to COME to AMERICA...and we should and will do the correct thing- by opening our doors......or we are hipocrits. In Los Angeles we have a homelessness - STATE OF EMERGENCY. There isn't LACK of housing- their is lack of AFFORDABLE housing, because greed has been confused with the word GOOD. Fourteen tornadoes. In one second many people's lives changed. If you can't figure out that we are here to help each other, then you've already lost everything. You didn't pay attention in history class or take notes in 2008-2010. The bubble that is in the real estate market is going to pop. IT has too- as things are out of balance. As this year comes to a close, attempt to tap into that light that is within you, and pour it out to someone who has none. Let us all tap into the lamp of love by carrying that internal to the external. Love is a verb. Love is action. Venus will be moving into Sagitarrus right as we enter the New Year. So an expanding heart, that is mature and able to see that the more you try to put yourself in 'the shoes of other' the more you will have understanding. Mars moves into Scorpio the first week in January. That placement is very very forward moving. No shades of grey. Let's do it. Whatever it is- is done with PASSION and COMMITMENT. As Venus explores 'how do I love you, let me count the ways' Mars is like- well, count all you want baby, just stop the philosophical lecture on love and put some elbow grease in it! Mars will carry the day for most of 2016- as he retrogrades back and forth in Scorpio- so SCORPIOS are going to be moving... shaking and creating beyond the mind! Scorpio rules debt- and the stock markets are going to be shake, rattle and rolling all of 2016. But I do see if we get back to a balance- all of this will be very good for the world. Something WILL be done about our huge world debt. Whatever happens during this holiday season by the New Moon mid- Jan......things will be set straight. When you hear the knock on the door (or within) OPEN IT. Mercury turns retrograde on Jan 5th.... you might think that you didn't hear correctly the tap tap tap... YOU DID. Turn down the music of the world, and the light of love will be so loud in your heart you will be certain you are a walking orchestra. YOU ARE. WE ARE. TURN IT UP. May the light shine bright for you and yours this Christmas Eve and every evening that follows.